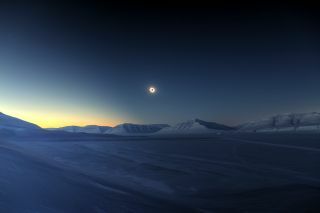 Luc Jamet (France) captured the total solar eclipse of March 20, 2015, from Svalbard, Norway — one of only two habitable locations able to witness totality — just 16 seconds after it began. The winning images from the Royal Observatory Greenwich's Insight Astronomy Photographer of the Year competition were announced last week, and the list is an awe-inspiring collection of celestial awesomeness. A record number of astrophotographers (more than 2,700) from 59 countries competed in the annual astronomy photography contest, according to the official website. The competition welcomes all kinds of astrophotography, from skyscapes to deep-space photos. When describing this year's winning solar eclipse image, contest judge Melanie Vandenbrouck said, "It is one of those heart-stoppingly beautiful shots for which you feel grateful to the photographer for sharing such an exceptional moment. The delicate disc of the occulted sun is perfectly silhouetted in the sky, and you can almost feel the below-zero temperature, the cool breeze of the Arctic. The snow is pristine, as if no one had ever stepped on it. This is an otherworldly landscape, which could be on an as-yet-unexplored planet." "Sunderland Noctilucent Cloud Display," the runner up in the skyscapes category in the Royal Observatory's annual Insight Astronomy Photographer of the Year competition. Taken July 7, 2014 at Seaburn Beach, Sunderland, UK. The contest is run by the Royal Observatory Greenwich, in association with Insight Investment and BBC Sky at Night Magazine. Photo submissions to the competition are divided into nine categories: skyscapes; aurorae; galaxies; our moon; our sun; people and space; planets, comets and asteroids; stars and nebulas; and the young astronomy photographer of the year. There are also two special categories: The Sir Patrick Moore prize for best newcomer, and the robotic scope prize. Judging this year's competition was likely no easy task. The runner-up in the skyscape category, titled "Sunderland Noctilucent Cloud Display," by Matt Robinson of the United Kingdom, is absolutely breathtaking. It captures a strange and beautiful evening sky that contains the striped colors of a rainbow; stretching out above a body of water, the light reflects off the clouds, making the sky appear to ripple like water. The second runner up, titled "River of Light," is an awesomely detailed shot of the Milky Way. The photo captures an incredible amount of color and texture in our home galaxy as it stretches across the night sky. "River of Light," a highly commended entry in the skyscapes category in the Royal Observatory's annual Insight Astronomy Photographer of the Year competition. Taken July 21, 2014 at Lac d’Aumar Parc National des Pyrénées, Hautes-Pyrénées, France. The winner of the planets, comets and asteroids category captured an incredible coincidental alignment of a comet and a nebula. Titled "The Arrow Missed the Heart," by Lefteris Velissaratos of Greece, it appears to show a glowing comet, with a long, narrow tail, piercing the heart of a deep-red nebula. Of course, it's only a trick of perspective (the nebula is much farther away than the comet), but the resulting image is still breathtaking. The winning images, along with the runners-up and many highly commended images from the competition, are being shown in a free exhibition at the Royal Observatory's Astronomy Centre in Greenwich, England. Winners and short-listed entries also will be published in the competition's official book, which will be available beginning Nov. 5.